I can upload photos again! Yay! So now you get the rest of the random stuff – this time with pictures. ~ I bought a very cool tea thing the other day at L.L. Bean. You put the loose tea in top and then add the hot water and it brews it right in the cup for you. Remove the tea and you can drink. This will make brewing tea at work so much easier. I wonder if Terry has one of these. ~ Speaking of Terry, I decided to try her breakfast of choice. She’s right – Fiber One is delicious and satisfying. It’s especially good with fresh blueberries on top. Just saying. ~And speaking of Terry again, Tuesday night Dale and I joined her and some other blog friends — Claudia, Sandy, Kate and Carol – to meet up with the visiting Norma. 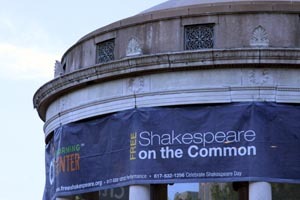 We had dinner at Durgin Park and went to watch Shakespeare on the Common for a bit. I feel so Bostonian. ~ My good friend JessaLu sent me the prettiest box bag. She made it herself and I just love it. I’m a spoiled blogger, that’s fer sure. That’s all the random I’ve got. How about you? Oooh, I like the tumbler and Jess’bag! Glad you all had a great time in Boston. I was sorry to have missed it. Too much running around getting ready for our vacation with no wiggle room. I tried Terry’s breakfast of choice too and was pleasantly surprised. I really expected it to taste like sticks, but it’s actually quite good. 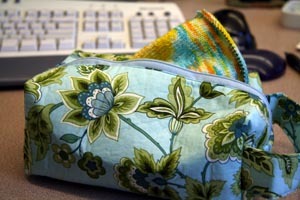 I love the little bags that Jessalu has made! The tea glass is a must. I’m going to look for one around here. Your bag is very pretty! I missed seeing you all in Boston. Courtney’s driver’s ed has put a crimp in our summer traveling plans for sure. Your random is more exciting than my random. 🙂 That tea tumbler is great! As soon as we get to Rangeley I’m heading straight for the blueberry patch. I like it on yogurt (Fiber One not the box bag, although I bet a bag with a side of yogurt is also nice). I have a tea brewing cup similar to that – everyone in my office covets it! What’s your favorite tea? OMG, Cookie got one of those too, and now I’m desperate to learn zippers so I can make twelve for myself! I love the tea cup – being a tea (not coffee) girl! Very cool box bag as well. Jon will be in Boston in two weeks – he’ll be sorry to have missed you I’m sure!! That’s some awesome random you’ve got there. Fiber One looks like chow mein noodles to me. I’m a big cereal fan, though, so I suspect I’d love it too. Everything looks great actually. You have a great life. It was a great dinner on Tues and nice to meet you. Fiber One is ok but I’m sticking to oatmeal or GrapeNuts. Your fresh blueberries would be good on cardboard, even! 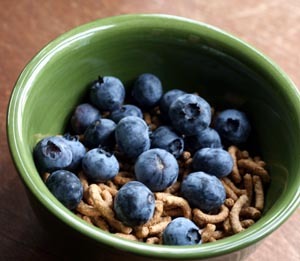 Just sayin’ – anything is better with fresh blueberries. VBG! mutter, mutter, enabler, mutter, trip to Whole Foods must happen. You do NOT want to uncork the random in me. IMO fresh blueberries on top of anything pretty much are the way to go. They’ve been extra good this year, don’t you think? I have one of those awesome “tea things”. I Don’t leave home without it. Ooh, I WANT that bag… you are a good one for bringing envy out in me, so un-zen:) I have a similar tea-thingie that works a lot like a combined press pot/to-go cup… you are gonna love that. Have a great weekend, grrl. I love the fiber one as well! They have some delicious breakfast bars also. Yummy! 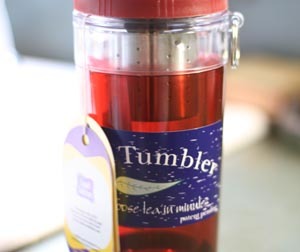 The tea tumbler is excellent! I have been eating the same breakfast since Terry mentioned it. It is delicious. The bag is just lovely. Isn’t Jessalu just the best? Love the bag, the tea thingy and the blueberries. I have nothing. Well… less than nothing, but we’re not going there right now. Love the Tea thing. I will have to pick one up the next time I am at our LL Bean. Also love the bag. I have a similar shaped one I bought on Etsy after seeing it on someones blog. You are one lucky blogger. That is a neat tea tool. I’ve recently discovered the tastiness of Fiber One. I was pleasantly surprised. I’ll get more on my next grocery adventure. Jessalu is one talented girl! Enjoy that great bag! I loved seeing you and Dale the other night! SO. FUN.